Can a last-ditch effort save a few scraps of Maxwell Street? The protesters gathered at the corner of Halsted and Maxwell one more time last Saturday. There were only 50 of them even at the height of the rally, but they represented the breadth of Chicago society: street vendors, real estate developers, students, professors, writers, and activists both professional and amateur. Joe Stefanovic, owner of Jim's Red Hots, provided free Polish sausage, fries, and soda to anyone who dared sample a taste of the old street. The Reverend John Johnson, late of the Maxwell Street Blues Bus, a mobile record store and fried-catfish dispenser, wore an imposing white suit and matching wide-brimmed hat and passed around a sign-up sheet for anyone willing to form a "human chain" against the arrival of the bulldozers. Then there were the signs: "Respect All Cultures: Make Tradition a Priority"; "UIC Cheats You Unfair"; "UIC: University Insensitive to Culture." With the remaining buildings from the beloved market area looming behind them like ghosts, speaker after speaker battered the University of Illinois at Chicago. The school was practicing "ethnic cleansing"; it was a "rogue elephant," a "destroyer of history." And the signs kept going up. "Save Chicago's Ellis Island"; "Heritage Is America." One speaker called the gathered "the feisty core that refused to go away." Pilsen activists warned that the university's plans to redevelop Maxwell Street were intricately tied in with the city's plans to do the same to Pilsen. With one photographer or reporter present for every five activists, everyone was trying to get a point across. An elderly black man wearing military camouflage took the megaphone. Throughout the rally he'd been selling peanuts for a dollar a bag. "Hello," he said, "my name is Bill Pratt, and I've been here ever since 1925. I was born March the 25th. I've been here ever since. I had business here. I don't want it to go. I want to work. All of us work! Here's one thing. I'm gonna do one thing. I'm gonna sing a little song." He took a breath and began to chant in Hebrew. This was a song he remembered from the 40s. This was what he recalled Maxwell Street sounding like. People stood in the middle of the street and passed out flyers or wandered around the intersection with signs, looking sort of lost. Chuck Cowdery, a writer and lawyer and the president of the effort to preserve Maxwell Street, spoke into the megaphone. "What you see before you," he said, "what you can see to the length of that street and the length of this street, is all that's left of something that was very important to thousands and thousands of people for 100 years, and for a lot of different reasons. It was where they could come and they could shop. It was where they could come and get food. It was where they could come and see their friends, meet people from home, get a beginning, get a start. And a lot of them left Maxwell Street. Quite honestly, a lot of them are a little bit embarrassed about the fact that they started on Maxwell Street. Maybe that's why they're not here today. But Maxwell Street got a lot of people started, and Maxwell Street will be a loss. "The amazing thing is that this is being done by a university that for years and years has had this struggle with its identity. What is the University of Illinois at Chicago? Who is UIC? Well, now they've established an identity. They've established an identity as one of the great destroyers of urban culture in America. That's their image now. That's their heritage. That's their culture. That's what they're gonna be remembered for. Ironically enough, that's what their students are gonna study. They're gonna read about how Chicago got started, how the blues got started, and they're gonna find out about how it ended. In front of the wrecking balls, the bulldozers hired by the University of Illinois. That's the one thing that they can't tear down, that they can't stop, that they can't destroy. People's memories, people's knowledge of the truth of what happened here. "So this is it! You're looking at it! You may be one of the last people to see it! Maxwell Street! People will be talking about it, people will remember it, people will continue to record songs about it, but you may be the last people to stand on it! You may be the last people to walk down it! Now would it be so impossible to save this? Would it be so impossible to keep this and build it up, make it something good, something special that people could come and enjoy? Would that be so difficult? Would that be so wrong?" The Maxwell Street Historic Preservation Coalition was born in 1994 out of the wreckage of the failed attempt to keep open the legendary Maxwell Street market. The university and city had divided and conquered activists from the beginning, and at this point few had any fight left in them. Two who did were Steve Balkin, a professor of small-business economics at Roosevelt University, and Bill Lavicka, a historic-housing rehabber best known for his work on the old Jackson Boulevard section of the near west side. 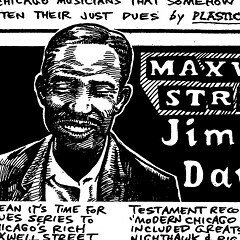 Balkin, Lavicka, and other survivors of the bitter battle decided that the next best thing to a living Maxwell Street would be to establish the place as a memorial to the immigrant culture that had passed through it and as a testament to Chicago blues history. Slowly but certainly, the university made their task more difficult. UIC purchased and tore down the legendary Nate's Deli and dozens of other buildings, erecting a parking lot and softball fields. With the people of Maxwell Street mostly gone, Balkin and Lavicka turned their attention to the several dozen buildings that remained. At least if the buildings were saved, they figured, the spirit of the street would never entirely die. About a year ago they entered into negotiations with the university, making it clear they would be a force whether UIC wanted them around or not. Joe Stefanovic recalls a meeting that the coalition had last year with UIC chancellor David Broski. Balkin brought along someone who had led the effort to preserve Memphis's historic Beale Street district. Stefanovic brought along the Polish sausages. Lavicka brought his temper. He stood up and said, "You're not gonna like what I have to say, David," and then proceeded to call the chancellor an "ethnic cleanser." "You could see the steam rising from Broski's head," Stefanovic says. "You wanna draw blood, Bill?" Broski said. "We'll draw blood!" Suddenly, the fight to save Maxwell Street had become personal. Stefanovic joked about putting a leash on Lavicka. But Lavicka and Balkin's war with Broski gave the fight to save Maxwell Street a little energy and just enough personality to get the media interested. Over the next year, the coalition gained members and force. Lavicka drafted an architectural plan for the street that allowed for some new buildings and used the old buildings for new purposes--dorms, shops, student apartments, classrooms. Buildings on Roosevelt Road that the university wanted to tear down could be moved to vacant lots on Halsted or Maxwell at minimal cost, Lavicka said. His design was attractive and intricate, a kind of Blues Land that gentrified the sketchier aspects of Maxwell but held on to the worthwhile things that remained. Meanwhile, UIC's plans remained a mystery. More than two months ago, Balkin, Lavicka, and a coalition member named Janelle Walker met with Carl Byrd and Shannon DeWith from the city's Department of Planning. They showed the city's people a video about Beale Street and presented Lavicka's plan. The Planning Department people doubted that the coalition's proposal was affordable, but were otherwise receptive and friendly, Balkin says. "Shannon seemed to be very interested, and she knew about Maxwell Street," he says. "She wasn't dismissive of us. She said the next step after seeing the numbers would be to arrange a meeting at her office with UIC and us. We thought that was a very positive step in the right direction, that it was demonstrating to UIC that the city has an interest in this, that it wasn't just a bunch of ragtag people who are interested in saving Maxwell Street." Balkin began calling DeWith once a week, but she never responded. He sent several letters. Finally the city agreed to sit down on Wednesday, March 25, with the coalition and UIC. Balkin and Lavicka came to the meeting thinking UIC was ready to cut a deal. James Foerster, UIC's assistant vice chancellor for administration and facilities planning, told them that the university planned to tear down every building in the Maxwell Street area as soon as it could. He named the six buildings that would fall first, two of them on Maxwell and four on Halsted. UIC intended, Foerster said, to preserve nothing besides two churches and the old police station. Lavicka went on a tirade. Then Balkin managed to get a few words in. He asked why the university didn't plan to build dormitories on the many parcels of empty land at Union and Maxwell. Foerster replied that it didn't want to. Balkin asked why it didn't consider constructing slightly taller dorms so some of the buildings could be saved. Foerster said tall buildings would block the view of the downtown skyline from the town houses UIC was planning to erect further south. Lavicka pointed out that people all over the city were turning old buildings into lofts. Foerster said that wasn't in UIC's plans. Balkin was furious. "We expected a good-faith negotiation, and they said they don't want to do anything to accommodate us. Everything we suggested they rejected....They mostly live in the suburbs, so they don't see any value to Maxwell Street or its history. There's nothing there for them to preserve....We're just a volunteer citizens' group. We're not asking for control of the buildings. We just want the buildings to be saved and reused. We have no financial interest in them. Admittedly, some of the buildings on Maxwell Street aren't by important architects, but their value is that we're preserving the physical remnants of important culture, the built environment of the Jewish and black and Mexican people as well as the other people who came here. Historic preservation ought not to be just saving the relics of rich white men. It's about preserving working-class history as well." The six buildings that UIC planned to bulldoze immediately were built between 1860 and 1926. They are brick, multiple-storefront structures from two to four stories tall, housing many businesses that have been, and continue to be, part of Maxwell Street's social fabric. Balkin and Lavicka realized that if those structures fell the area around Halsted and Maxwell would be irreparably blighted and any effort to preserve Maxwell Street would be finished. The next day, in an eighth-floor room of the fortresslike student center off Harrison Street, UIC unveiled plans for a new "Campus Town" that would stretch from Roosevelt Road on the north to 15th Street on the south. There would be a new performance-arts center and administration building, ample student housing, lots of parking lots, and dozens and dozens of town houses costing up to $300,000 each. The plans called for preserving three buildings on Halsted for "retail" use, but only in the initial phase of development. Ten years down the road, Foerster told those gathered, there would be no buildings from the old Maxwell Street left standing at all. Lavicka and another coalition member, a UIC graduate student named Dan Marmer, showed up to heckle Foerster about the plans. They asked him when the university planned to demolish the "Maxwell Street Six." Afterward they went up to Foerster's office to confront him directly. "We're going to start tearing down these buildings in a couple of days," Foerster said. "Whaddya mean, in a couple of days?" Lavicka asked. "Today's Thursday. A couple days means this weekend. You got a demolition permit?" "You're in charge of facilities and you don't know if you have a permit?" "When are the buildings coming down? It's Thursday already." "You've got a couple of days," Foerster said. Twenty days must pass after a permit is applied for before demolition can begin--ten days of "aldermanic review" and another ten of examination by the Environmental Protection Agency. As of March 26, the day Foerster encountered Lavicka at UIC, the university had not applied for a permit. Foerster says he's not sure if the process has begun. "I know we don't have the permits in hand now," he says. Foerster says UIC has asked the coalition for a priority list of "five or six" buildings to save in the area. The coalition responded by sending him a priority list of 50 buildings. This hasn't done anything to bend Foerster their way. "For us to do that would basically preclude us from doing any of the redevelopment of the land down there," he says. "That's not within the constraints of our planning." Foerster says the buildings on Halsted and Maxwell have numerous code violations and would be very difficult to convert into dormitories or even storefronts. "It may well be true that the buildings can be restored for residential use, as Bill Lavicka has done elsewhere very effectively," he says. "We'd even be willing to look into moving those buildings to another part of the city. It would save us demolition costs. But they're not suitable for university purposes." The coalition has essentially responded to UIC with the finger. The week after Balkin and Lavicka's meeting with Foerster was a blur of press releases, phone calls, emergency research into UIC's land-acquisition policies, and, finally, the rally last Saturday, where Jimmie Lee Robinson, born on Maxwell Street in 1931 and one of the oldest of the old-time blues guys, sang the title song from his next CD, Maxwell Street (Tear Down) Blues. "I used to take my family shopping down in Jewtown," it went, "and walk down that great street known as Maxwell Street. Here it is again, that wrecking ball....The great history of this area, which once stood proud and tall. Guess what UIC--you've managed to destroy it all." An old-time blues band led by old-time Maxwell Street denizen Piano C. Red played old-time blues, fronting what used to be the market but is now an expansive parking lot occupied by a lone two-door red sedan. Chuck Cowdery, who for the past six months had been as immersed in the politics of expansion as anyone else in the coalition, choked up as he surveyed the street. He knew these were desperate times. Art accompanying story in printed newspaper (not available in this archive): Jimmie Lee Robinson, Chuck Cowdery, and various photos by J.B. Spector.